You are looking at a liquid crystal display (LCD) right now, but what are liquid crystals? Check back for new posts every week! For more liquid crystal photos, latest science, art, research and my other projects. 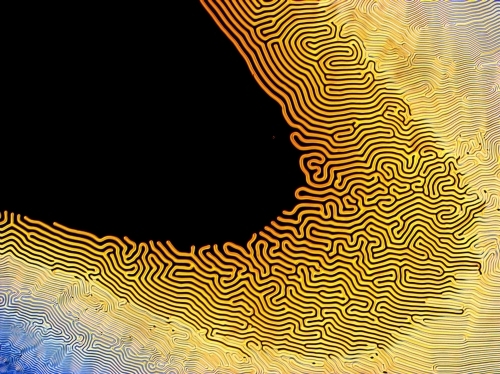 The surreal structures in this micrograph are created by heating a nematic liquid crystal with a sharply varying chirality across the slide to its nematic-isotropic (melting) temperature. The black regions are mostly melted liquid crystal in the isotropic phase, which between crossed polarizers looks black. 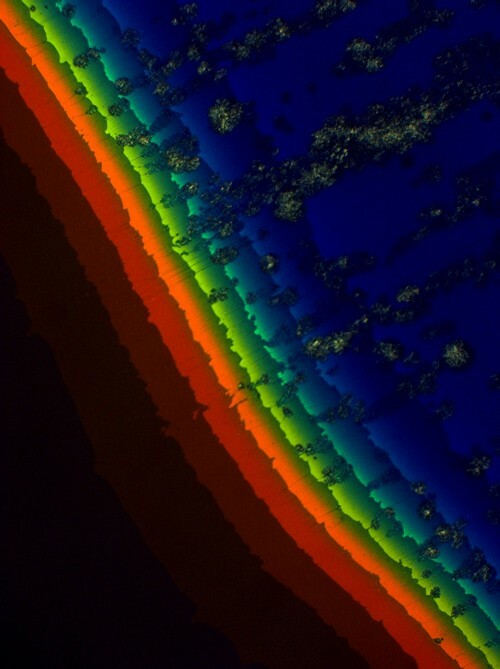 This image was exhibited in the art place at Linacre College, Oxford, within a special liquid crystal exhibition in 2013. Please maximise the image below to fill your screen. Colours of light have different wavelengths. If a repeating structure has the same length as the light's wavelength, then that light can be reflected. 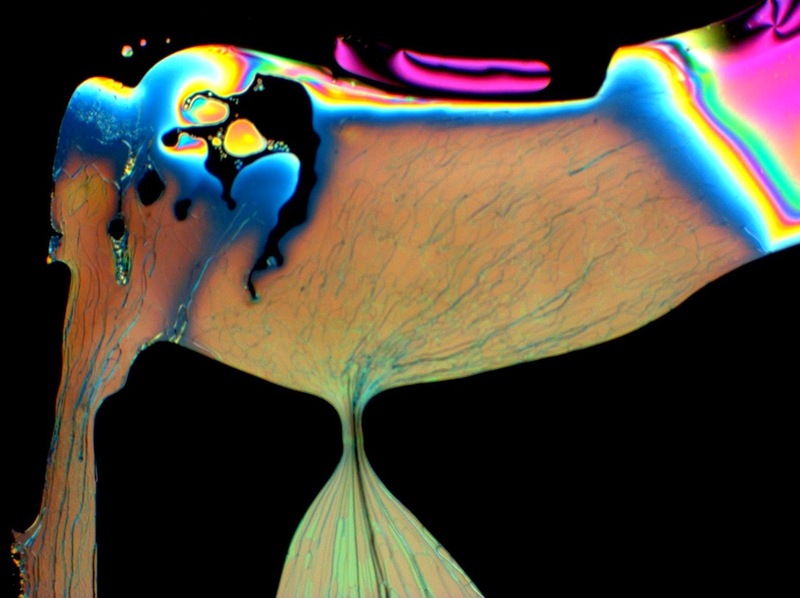 In this picture, a liquid crystal whose structure varies across the image allows different colours of light to pass through, resulting in this rainbow-like picture. A lot of the images on here, including the zoomable images, can be viewed and downloaded at full resolution from my flickr: Ben's liquid crystal photography on flickr. Please use these images for educational and non-commercial purposes only. Liquid crystals are a fluid, but have some properties that crystals have. They are structurally ordered, unlike isotropic ('normal') fluids like water. This means they can interact with light to produce patterns like what you see here when you use filters to see what's happening to the direction of the light polarization state (i.e. which direction the light's fields are wiggling). This particular example has a gradient across the cell in the concentration of an asymmetric additive, resulting in the structure changing how much it likes to twist in a spiral. You can't see the spiral itself, only the effect on the light passing through. Since a spiral has a periodic structure that repeats itself, the result is a periodic stripy pattern that you can see here. It's sometimes called a 'finger print' texture. Please maximise the image below to fill your screen. The image has been stitched together from hundreds of polarizing microscope photographs. It shows a 'liquid crystal cell', or two pieces of glass separated by 10 microns (10 millionths of a meter) and filled with liquid crystal. The cell is approximately a centimetre wide. Several different types of liquid crystal have been filled into the cell, in order to make it look pretty! Can you tell me what you think is going on? There is an artefact at the bottom where the computer program was unable to stitch the images properly together. If you have experience and would like to do a better job than me at stitching, please get in touch and I can send you the source images!